Ellen G. White... A Wolf in Sheep's Clothing! New Audio - "New Covenant Glory"
Questions About Hell? Here's a Bible study for you. Definition of a religious cult and fulfilled by Ellen G. White and the SDA Church. 1. A leader or group of leaders, prophet, prophetess, that claims to speak for God. We could stop here with the first quote of EGW as she claims to replace Jesus Christ and is now speaking for God. This in itself shows that Adventism is a cult when comparing it with Hebrews 1:1-2. EGW: "In ancient times God spoke to men by the mouth of prophets and apostles. In these days He speaks to them by the testimonies of His Spirit. There was never a time when God instructed His people more earnestly than He instructs them now concerning His will and the course that He would have them pursue." -- Testimonies, vol. 5, p. 661. Bible: Heb 1:1 - 2 (NIV) 1In the past God spoke to our forefathers through the prophets at many times and in various ways, 2but in these last days he has spoken to us by his Son, whom he appointed heir of all things, and through whom he made the universe. The term "the testimonies of His Spirit", by Ellen G. White is referring to her own prophetic ministry as recorded in her books and letters, and is understood as such by the SDA denomination. God never told his church that Jesus would be replaced by Charles Taze Russell, Mary Baker Eddy, Joseph Smith or Ellen Gould White or any other prophet or prophetess. Further EGW claims that God is instructing "his people more earnestly" now than did the prophets, apostles and even Jesus Christ through her testimonies. Heresy!!! Of course in EGW's mind "his people" are the SDA sabbath keeping people that believe that she has the "spirit of prophecy". EGW: "In these letters which I write, in the testimonies I bear, I am presenting to you that which the Lord has presented to me. I do not write one article in the paper expressing merely my own ideas. They are what God has opened before me in vision--the precious rays of light shining from the throne." --Testimonies 5 p. 67. Do you believe that it is Jesus speaking to his church (SDA denomination) or do you accept the heresy of EGW and her testimonies? 2. What they write and teach their followers, contradicts Bible. Fulfillment: Read, "Ellen G. White Contradicts the Bible Over 50 time" EGW holds strict authority over its members in respect to, finances, wills, diet, dress, amusement, associations, etc. as taught in her books such as Testimonies to the Church. 3. Many members taking issue with the authority of the leader are excommunicated, (disfellowshipped), shunned, or not allowed to hold office in the church, etc. Fulfillment: EGW: "When the judgment of the General Conference, which is the highest authority that God has on earth, is exercised private independence and private judgment MUST NOT be maintained, but must be surrendered." Testimonies 3 p. 492. Look at the SDA pastors that were fired for not believing in some of Ellen G. White’s teachings. Also members who have been put out of office and disfellowshipped for not accepting Ellen G. White as a prophet or her teachings. 4. Cult leaders teach infallibility in their teachings or the writings of their cult leader, in this case Ellen G. White. Fulfillment: "It is from the standpoint of the light that has come through the Spirit of Prophecy (Mrs. White’s writings) that the question will be considered, believing as we do that the Spirit of Prophecy is the only infallible interpreter of Bible principles, since it is the Christ, through this agency, giving real meaning of his own words." G.A. Irwin, General Conference President, from the tract The Mark of the Beast, p. 1. "Our position on the Testimonies is like the key-stone to the arch. Take that out and there is no logical stopping-place till all the special truths of the Message are gone...Nothing is surer than this, that the Message and visions (of Mrs. White) belong together, and stand or fall together." Review and Herald Supplement, August 14, 1883. 5. The cult members believes that they are superior to others because of their unique teachings as they have knowledge of God’s will that other Christians do not have. Because of the false teachings of their prophet or leaders, they consider themselves especially chosen by God, and look at themselves as the "Remnant Church," or "The True Church". Fulfilled: Ellen G. White and the Seventh-day Adventist Church view themselves as "the Remnant Church" alone especially called by God in 1844, over all other churches, which they called Babylon. The Adventist still considers themselves the Remnant Church. Read, "Seventh-day Adventist Believe 27," Chapter 12, The Remnant and Its Mission, p.153. Seventh-day Adventist Believe: "One of the gifts of the Holy Spirit is prophecy, This gift is an identifying mark of the remnant church and was manifested in the ministry of Ellen G. White." "Seventh-day Adventist Believe 27," p.216. Without Ellen G. White and her Bible Contradictions, the Seventh-day Adventist Church could not call itself the Remnant Church. In fact the Word of God never calls any denomination a remnant church. 6. Adventist leaders and their members use the writings of Ellen G. White to interpret the Scriptures. EGW's writings are the final arbitrator of doctrines. Fulfilled: The Adventist’s claim to hold the Bible above all teachings, but in fact they interpret the Bible by the writings of Ellen G. White. This is demonstrated in their Sabbath school Quarterlies, sermons, and articles in their church paper, "Adventist Review." Her counsel is to be followed as Scripture. 7. They publish their own Bible and insert their own doctrines in the text. Fulfilled: The Seventh-day Adventist Church publishes The Clear Word Bible. It is a cultic Bible that does not separate the Bible text from the author’s personal commentary, opinions, which slants the text to agree with the writings of Ellen G. White and whatever else to make the text say what he wants it to say. This corrupt piece of work, makes the Word of God unclear to the reader. Adventist scholar Dr. Sakae Kubo say’s, "I am concerned about how our membership regard and use Blanco’s Clear Word. Behind my remarks is a history of Bibles of this sort that have a terrible bias. The Jehovah’s Witnesses’ New World Translation is an obvious example—the divinity of Christ is removed and His createdness is brought out along with other tendential characteristics. The very obvious and serious danger is that our own people will be confused as to what the Bible really says. Interpretation has been so mixed in with the text that our people will think that the interpretation is part of the Word of God." Adventist Review, April 1995, p.15. 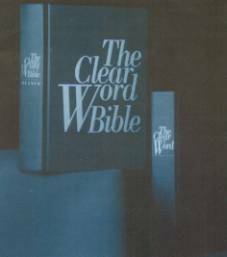 The Clear Word Bible, 1994 by Jack J. Blanco. 8. Religious cults look at individuals that leave their group as being lost, and without salvation. Fulfilled: It is difficult for Seventh-day Adventists to fathom that a person leaving their church that disagree with Adventist doctrines can remain a Christian and still be saved. They often conclude someone must have hurt their feelings in an effort to justify their departure. After I left the Adventist Church I had letters telling me I was being led by Satan, I was making war on God's church, I would burn in Hell, and that I should come back to the church, etc. Christians that do not belong to the Seventh-day Adventist Church are often called "outsiders." When a Christian from another Church joins the Seventh-day Adventist Church, they are said, "to have come into the truth." They are often "encouraged" to be rebaptized. 9. What is a cult? A religious cult is an organization that has departed from mainstream Christianity to follow doctrines that are not Biblical. They hold their leader's Bible contradictions over the Word of God. The Seventh-day Adventist Church teaches many non-Biblical doctrines. Webster’s Dictionary by Random House: cult n. 1. a particular system of religious worship, esp. with reference to its rites and ceremonies. 2. a. a group that devotes itself to or venerates a person, ideal, fad, etc. 3. a. a religion or sect considered to be false, unorthodox, or extremist. b. the members of such a religion or sect. -adj. 4. of or pertaining to a cult. 5. of, for, or attracting a small group of devotees: a cult movie. cultic, adj. cultish, adj. cultism, n. cultist, n.
Are there different kinds of cults? Most definitely. There are religious cults, Satanic cults, secular cults. Some cults are purely secular such as; sport idols, UFO cults, movie stars, and some are dedicated for good of society. A cult in itself is not necessarily evil. Christians need to be alert as to what is being taught as truth and refuse to accept Biblical Contradictions especially if a church has a prophet. People find comfort and security in belonging to religious cults, as it agrees with their beliefs that they were brain-washed into believing as truth. SOURCE: Is the SDA Church a Cult? By Gregory G. P. Hunt, M.D., B.Sc., F.R.C.P. Chapter 7 - Why All This Fuss about a False Prophet? Who Cares?